Dr. Ed Berry on Human and Atmospheric CO2! Interesting read. The comments back and forth are ongoing and worth the price of admission. So it's just a coincidence that sharp rises in atmospheric concentrations of greenhouse gases just happened to coincide with anthropogenic emissions? I hope we are not regressing back to debate if humans are even affecting atmospheric CO2 levels. If so God help us all. The age of misinformation and alt-science has begun. 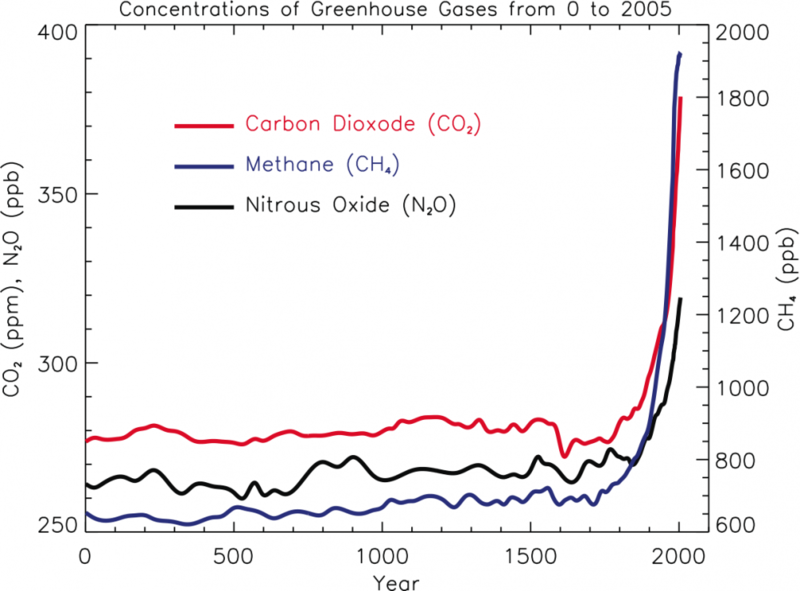 1: Anthropogenic sources have emitted ~2,000Gt of CO₂ since the preindustrial. 2: Atmospheric concentration has risen by ~850Gt / 120ppm. 3: The remaining ~1150Gt is no longer in the atmosphere – it has been sequestered by the land and oceans. 4: Hence the land and oceans have been a net sink for atmospheric CO₂ over this period, and 100% of the 120ppm rise in atmospheric CO₂ is anthropogenic. Dear Icarus62, Thank you for your comment because it is directly on point. You have presented the key 4 steps of the standard argument that human CO2 caused 100% of the rise in atmospheric CO2. They are the same 4 steps that I present and rebut in my article above. The 4 steps fail because of invalid wording in steps 3 and 4. The phrase “land AND oceans” should be “land OR oceans.” The fact that (land + oceans) is less than 0 does not prove (land is less than 0) AND (oceans is less than 0). The fact is that land can be a net sink even while oceans can be a net source. Therefore, step 4 is invalid. The 4-step argument does not prove human CO2 drives atmospheric CO2. That is because there are other scenarios where oceans can drive atmospheric CO2, while still meeting all the constraints of steps 1-3 after the “and” in step 3 is changed to “or” as required by logic. My Fig. 1 above is the scenario were land absorbs all the human CO2 while ocean emissions equal its absorption. In that scenario, atmospheric CO2 would remain constant. Steps 1-3 (with the “or”) do not exclude this scenario. A second scenario can be where land absorbs all human CO2 emissions while oceans add CO2 to the atmosphere. (Simply change the ocean input in Fig. 1 from 44 to 46.) Steps 1-3 (with the “or”) do not exclude this scenario. As you can see, there are an infinite number of scenarios that prove the 4-step argument is wrong. You are not the first to challenge me with this 4-step argument. Keith Pickering, writing for Peter Gleick and company, challenged me with the same 4 steps. Keith acknowledged that I would win if I could produce even one scenario that showed his argument wrong. I did and Keith provided no counter argument. To my knowledge, Peter Gleick and company no longer use carbon isotope arguments to argue human CO2 is responsible for all or even most of the increase in atmospheric CO2. Wow. Even I think this is insanity. LOL. But people will believe it. Scary. I respect the red tags, but surely you can do better. Please explain, from a scientific perspective, why "this is insanity" and "scary". This paper asserts, " Human CO2 emissions do not control Atmosphere CO2." 1. It misses the elementary matter of marginal contributions. Prior to the increase in human emissions, total annual carbon dioxide emissions were relatively equal to annual absorption in sinks. The outcome was a relatively stable atmospheric concentration of carbon dioxide. 2. The increase in human emissions led to total annual emissions > total annual absorption. The outcome was an increase in the atmospheric concentration of carbon dioxide. 3. Even as the paper rules out the impact of a human contribution (incorrect, IMO, and in the scientific consensus), it offers no plausible mechanism for the rise in atmospheric concentration that has occurred, especially in the past 50-100 years. The idea that the carbon sinks had suddenly reduced their uptake of carbon dioxide is not supported in the literature. There is little compelling evidence that the kind of dramatic reduction necessary to explain the increase in atmospheric carbon dioxide (absent a human impact) has occurred. There is also little evidence of any kind to suggest the kind of dramatic increase in natural carbon dioxide emissions necessary to explain most or all of the increase in atmospheric carbon dioxide. All said, assuming the blog entry reasonably represents the paper and its conclusions, the paper contains fundamental flaws. I would be surprised if it passes peer review. Notice that the article states that the earth absorbs roughly 50% of the human carbon dioxide emissions. That means the other half wind up in the atmosphere. If human emissions are increasing and only 50% of such emissions are absorbed, then humans are contributing an increasing share of the increase in atmospheric concentration (barring a similar or larger increase in natural emissions). That 50% of human emissions are absorbed and total emissions are natural and anthropogenic, that means that the human contribution is, in fact, making the marginal difference when it comes to the rising atmospheric carbon dioxide concentration. In the past, pre-human era, increasing solar insolation touched off rising carbon dioxide (and other greenhouse gas emissions) from the thawing that took place. That's why temperature and atmospheric carbon dioxide moved in lockstep with an initial rise in temperature often preceding the rise in carbon dioxide. At that time, increasing solar insolation and the warming that resulted were the proverbial key that unlocked carbon dioxide from storage so to speak. Today, humans are another key that unlocks stored greenhouse gases via the burning of fossil fuels. I have been referred to Dr. Berry's blog and a response he made to my AmWx comment, which was pasted there, but not by me. 1. Nowhere in the blog entry or his response is a natural mechanism introduced to explain the dramatic increase in atmospheric carbon dioxide that has taken place since the Industrial Age and especially during the last 50-100 years. If the human contribution is not making a marginal difference, one could only arrive at that outcome by (1) a dramatic increase in natural emissions, (2) a dramatic decrease in the uptake/absorption of carbon dioxide, or some combination of the two. With respect to the first element, there is no credible empirical literature that points to a significant increase in natural greenhouse gas emissions during that period of time to account for the relevant increase in atmospheric carbon dioxide. With regard to the second element, the literature actually indicates that there has been a net increase the uptake of carbon dioxide over the last 50 years. In short, there is no empirical literature or data to substantiate one or both of the major factors required to effectively rebut a significant human contribution. As a result, one is left with nothing more than an empty claim that the human factor has been insignificant and a hypothesis that some unidentified natural factor has led to the dramatic increase. In substance, one is asked to accept, as an article of faith, that the human contribution has been insignificant. Without credible and sufficient empirical evidence, that's an unreasonable request. All said, the blog entry fails to prove its central premise. 2. Stability in the atmospheric concentration cited by me at AmWx referred to the recent past prior to the Industrial Age. Obviously, over paleoclimate/geological timescales, there have been large fluctuations in atmospheric carbon dioxide. These changes have often been brought about by changes in solar insolation. But today's atmospheric concentration is the highest it has been in some 350,000 years and there was no solar insolation trigger involved. 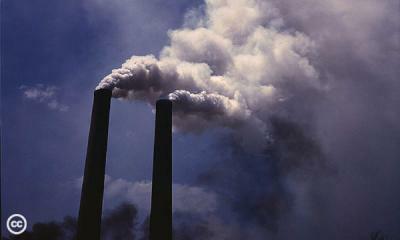 If the increase in emissions from human activities is not responsible, what is? The blog entry provides no explanation. A second feedback involves atmospheric CO2. Direct measurement of past CO2 trapped in ice core bubbles show that the amount of atmospheric CO2 decreased during glacial periods..., in part because more CO2 was stored in the deep ocean due to changes in either ocean mixing or biological activity. Lower CO2 levels weakened the atmosphere's greenhouse effect and helped to maintain low temperatures. Warming at the end of the glacial periods liberated CO2 from the ocean, which strengthened the atmosphere's greenhouse effect and contributed to further warming. In fact, some evidence suggests that solar insolation during the summer may have been declining slowly over the past 1,000 years in the Arctic. The result was gradual cooling there, until the temperature trend diverged from decreasing solar insolation. Changes in solar insolation cannot explain the big increase in atmospheric carbon dioxide that has taken place, especially over the past 50-100 years. Name-calling by Dr. Berry notwithstanding, it's difficult to see the paper's passing peer review. I realize that Dr. Berry has taken it emotionally based on his response. But peer review is robust and it requires strong substantiation of claims. Perhaps I'm wrong, but the failure to provide empirical support to back the argument of an insignificant human impact coupled with the failure to introduce a meaningful alternative explanation (even a hypothesis) suggests a weak paper. That's the blunt reality of the situation. Deflections e.g., name-calling, can't overcome what appear to be fundamental flaws in the argument made. Thanks for posting in a thoughtful and sincere manner. As numerous posters have said over the years, you are a class act. My intent in posting Dr. Berry's link is to promote the free flow of credible information. To all posters (not just Don), it would be very enlightening to see an exchange of thoughts on Dr. Berry's site. I know he has a PhD in Atmospheric Physics, so any valid points in favor of AGM that could be made in such a setting would be extraordinarily impressive and convincing. PET PEEVE: Articles on global warming / climate change with pictures of smokestacks emitting water vapor to fool public into thinking this is (1) CO2 and (2) a pollutant akin to emissions outlawed in the '70s by the Clean Air Act. Disingenuous at best and destroys any credibility these article might have. 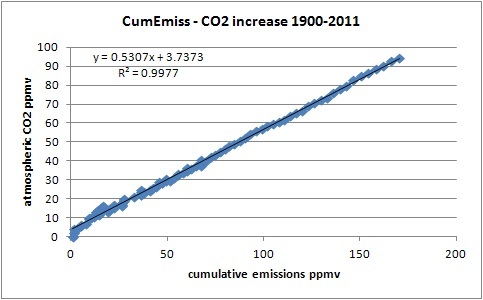 Here is the increase in atmospheric CO2 vs cumulative emissions of CO2. Fig. 3 shows Atmosphere CO2 scaled to fit Human CO2 emissions and the annual change in Atmosphere CO2 (References: NOAA, 2016; CDIAC, 2016; IPCC, 2007b). Fig. 3. Human CO2 emissions, annual change in Atmosphere CO2, and Atmosphere CO2 scaled (by subtracting 266 and dividing by 50). Salby (2016) makes the following three arguments using Fig. 3. Human CO2 emissions increased significantly after 2002 due to China’s contribution (Oliver, 2015). Yet Atmosphere CO2 continued its same steady rise. In some years, particularly the period from 1988 to 1993, the rate of increase of Atmosphere CO2 falls while Human CO2 emissions continue to rise. Munshi (2015) and Munshi (2016) compared the annual change in atmospheric CO2 with annual human CO2 emissions. His detrended statistical analysis shows their correlation is zero. Therefore, Human CO2 emissions do not control Atmosphere CO2. There is nothing credible or intellectual about this topic and I and others don't have the time to waste. This has been discredited over and over again. Here is a sample of what you can uncover for yourself with a little effort. Critical information is missing if one wants to do year-by-year evaluations. The chart provides no data on the natural CO2 emissions or CO2 absorption. The conclusion (human CO2 emissions do not control atmospheric CO2) stands on incomplete information. Moreover, marginal contributions do not require human emissions > natural emissions. Human emissions could be relatively small in comparison to natural emissions, but that small contribution could be sufficient to create an imbalance between total annual emissions and total annual absorption over the long-term, yielding a long-term increase in the atmospheric concentration of CO2. The study to which I linked noted that approximately 50% of the human emissions are being absorbed in carbon sinks. That means the other 50% are contributing to atmospheric CO2. Over the past 50-100 years, what would things look like if there were only natural CO2 emissions? How would that scenario differ from the present situation? Would the difference be statistically significant? Often one has heard the arguments made in the contrarian camp that CO2 is a trace greenhouse gas or that human greenhouse gas emissions are a small fraction of natural emissions, therefore the human contribution is insignificant. Those arguments miss the concept of marginal contributions. For illustrative purposes, consider a fixed situation where oil is the only source of energy and maximum oil production is X barrels per day. Oil production is X barrels per day and oil consumption is X barrels per day, on average. In other words, over the long-term there is a general equilibrium. Suddenly one country slightly increases its consumption (a small fraction of global consumption), leading to a situation where production is X barrels per day but consumption is X+1 barrels per day. In the long-run, that situation is not sustainable. The price rises and quantity demanded returns to the equilibrium level. With the carbon cycle, there is no pricing mechanism to bring about a reduction in the quantity demanded, or in the case of carbon, total emissions. Instead, the imbalance (total CO2 emissions > total CO2 absorption) is accounted for by atmospheric storage of CO2 (rising atmospheric concentration). That the source of the imbalance (human contribution) might be small relative to total or natural emissions is irrelevant. That an imbalance exists is all that matters. Without the human contribution, there would not have been the imbalance that has been observed. That's why the IPCC declared, "With a very high level of confidence, the increase in CO2 emissions from fossil fuel burning and those arising from land use change are the dominant cause of the observed increase in atmospheric CO2 concentration (p.467). Dr. Berry's response dismissed the notion of a human marginal contribution responsible for the rising atmospheric concentration of CO2. He provided no alternative explanation. If one ran a trend line on annual human emissions and compared it to the line depicting scaled atmospheric content, the curves would very similar. In his response to my pasted comment, he also declared, "...the statistical correlation between human emissions and the rise in atmospheric CO2 is ZERO." Nowhere did he provide the underlying data. That's an example of an unsupported claim. With such data, one could run the statistical numbers. Peer review would require that the data be furnished so that it could be examined. In addition, in reading through his posted comments, it appears very unlikely that he will ever submit his paper for peer review, even as one of the people commenting provided him the name of a peer-reviewed journal that does not require any financial payments by authors submitting articles. Peer review is where his work would be subjected to serious scrutiny by those with the requisite expertise to fully evaluate his work. Finally, given his responses to critiques (not just mine), it is difficult to see the possibility of a serious and informative dialogue, which is unfortunate. Instead, he was taken aback by my suggestion that if the blog article were representative of his paper, his paper might not pass peer review. But without strong underlying evidence to substantiate his case and a plausible alternative explanation for the rise in atmospheric CO2, it is difficult to envision his paper's passing peer review. That's not meant to be mean or personal. That's objective, at least if the blog article reflects the body of work behind his conclusion. Of course, that's probably a moot point. Well prior to that response, his comments indicated an unwillingness to submit the paper for peer review (he cited an unwillingness to make a payment to a peer-reviewed journal), and there was no change in his position even when an option for doing so at no cost was suggested. Critique: The IPCC’s 5th Assessment Report (Chapter 6) provides summary data and strong lines of evidence that substantiate the role human CO2 emissions have played in increasing atmospheric CO2. The Greenhouse Effect is long-established. The article provides no substantiating evidence that could raise meaningful doubt about either argument. • Switches the wording of arguments for illustrative purposes but provides no technical substance to undercut the core arguments that underpin an anthropogenic component to climate change. • Contains a diagram derived from the IPCC’s Third Assessment, among other sources. This is old work. The IPCC’s Fifth Assessment is available. CO2 emissions from fossil fuel burning are virtually certain to be the dominant factor determining CO2 concentrations during the 21st century. There is scope for land-use changes to increase or decrease CO2 concentrations on this time-scale. If all of the carbon so far released by land-use changes could be restored to the terrestrial biosphere, CO2 at the end of the century would be 40 to 70 ppm less than it would be if no such intervention had occurred. By comparison, global deforestation would add two to four times more CO2 to the atmosphere than reforestation of all cleared areas would subtract. There is sufficient uptake capacity in the ocean to incorporate 70 to 80% of foreseeable anthropogenic CO2 emissions to the atmosphere, this process takes centuries due to the rate of ocean mixing. As a result, even several centuries after emissions occurred, about a quarter of the increase in concentration caused by these emissions is still present in the atmosphere. CO2 stabilisation at 450, 650 or 1,000 ppm would require global anthropogenic CO2 emissions to drop below 1990 levels, within a few decades, about a century, or about two centuries respectively, and continue to steadily decrease thereafter. Stabilisation requires that net anthropogenic CO2 emissions ultimately decline to the level of persistent natural land and ocean sinks, which are expected to be small (<0.2 PgC/yr). Selective use of the IPCC’s information while omitting critical details does not fairly represent the situation as the IPCC describes it. The illustration depicts all human emissions being absorbed by the land/oceans. Yet, the literature shows that 55% is absorbed. 45% is not. With a very high level of confidence1, the increase in CO2 emis­sions from fossil fuel burning and those arising from land use change are the dominant cause of the observed increase in atmospheric CO2 concentration. The blog relies on the diagram purporting a balance between emissions (including human emissions) and absorption. As that diagram is incorrect, all conclusions drawn from reliance on that diagram are incorrect. In effect, the article’s basic claim that “human CO2” is not “the major cause of the observed change in Atmosphere CO2” is incorrect. This section draws from a single paper. In the past, increasing solar insolation/rising temperature triggered the release of CO2 into the atmosphere. That release led to further warming. The paper assumes no other mechanisms for releasing CO2 from storage exist. Yet, the burning of hydrocarbons releases CO2. Combustion is an alternative mechanism for releasing stored CO2. Therefore, assuming that warming must precede the increase of CO2 is a flawed assumption. It generally rests on the premise that human CO2 emissions are very small relative to natural emissions, therefore, human emissions cannot be responsible for the rise in atmospheric CO2. That is flawed logic that ignores marginal contributions. Even a tiny additional increase in emissions that persistently exceeds absorption (the literature shows that only 55% of human emissions are absorbed), can lead to a large cumulative increase in atmospheric CO2 concentration over time. That’s what happened since 1750. The IPCC’s conclusion concerning the role of human emissions is consistent with what happened. The article offers no alternative mechanism to explain the increase in atmospheric CO2 that has taken place since 1750. The article, as posted on the blog in its current form, lacks technical merit. • Its chart that depicts balanced CO2 emissions and absorption contradicts the increase in atmospheric CO2 that has taken place since 1750. The article is comprehensible, but it is deeply and technically flawed. It aims to rebut a large body of evidence related to human emissions (as summarized by the IPCC) and undercut the long-established Greenhouse Effect. On account of its deep flaws/technical shortcomings, it fails to do so. Anyway, that's my opinion. It will be interesting to see if the paper is ever submitted for peer review and, more importantly, whether it is published in a credible scientific journal. My guess is that such an outcome would require substantial changes. In any case, I believe Dr. Berry's piece would benefit from the kind of feedback that is only possible through rigorous peer review. I hope he pursues that route. Thanks for contributing. Unfortunately, it is apparent that much of the climate discussion ( a euphemism, I know) involves talking past each other. I can't force you to post on Dr. Berry's site any more than I could force Dr. Berry to post here. The lack of direct dialogue is a loss to all - at least to all that still have a semblance of an open mind. Very funny indeed. You do realize that you link to a hit piece by Ed Grimsrud, who looks from all objective observation to be locked in a personal feud with Dr. Berry. Did you check out the comments in the article by Dr. Berry that is the subject of this post? Eric's numerous comments evidence a clear inability to win an argument and show a level of emotion that undercuts any confidence in his assertions. By the way, I didn't see Mr. Grimsrud attack Dr. Berry's credentials in any of his comments. Please refer me to those comments if I missed something. In my line of work, I often have to judge the credibility and testimony of expert witnesses. So that brings me to the dismissive Chubb. Chubb, good fellow, you link to two blog posts by Richard Telford, a professor of palaeoecology. Seems like a bright person and who can argue with someone who is an expert in a field of study with so many vowels, especially in a row. But paleoecology is the study of fossils and sub fossils to reconstruct ecosystems from the past. So, when arguing global warming / climate change cause and effect, the credibility of a palaeoecologist de facto pales to that of an atmospheric physicist. And neither Eric Grimsrud, JC-CT or anyone else has asserted that both Dr. Ed Berry and Dr. Murray Salby are not doctors of atmospheric physics. So, for those reading this with an open mind, do you find it somewhat disturbing that some, with unknown credentials, (although if they have doctorates in atmospheric physics, I suspect we'd know about it) find it perfectly ok to dismiss the work of these PhD atmospheric physicists in such a condescending, derisive manner? Not you Don, although as I mentioned above, it would be awesome if you engaged Dr. Berry directly. Yes I am completely dismissive on Salby/Berry and proud of it. I feel you are being dishonest. You say you want technical discussion, but you have completely ignored every technical point. Instead you focus on unimportant issues like degrees, credentials, who can criticize who etc. If your belief is that Salby and Berry are above criticism because they have certain degrees, then there is no point in trying to have a discussion. Yeah, I understand the personal feud that is going on, and that wasn't really the point. The point is that if you go to the publications section of Dr. Berry's website, as Grimsrud suggests, you will find that he hasn't published anything peer-reviewed since 1981. Here's what makes it largely, perhaps wholly, futile to engage him on his blog. IPCC's findings tie human CO2 emissions to the increase in atmospheric CO2 that has occurred since 1750 (and also more recently). Dr. Berry, on the other hand, notes a study that found fossil fuel emissions have little statistical correlation to changes in atmospheric CO2 on an annual basis. Internal variability on a yearly basis can mask longer-term trends e.g., ENSO, among other natural cycles, leads to variability in global temperatures on an annual basis. Yet, the long-term trend is very strongly correlated with the long-term trend in atmospheric CO2. Dr. Berry simply points to the lack of strong correlations with fossil fuel emissions and changes in atmospheric CO2 on an annual basis and then, incorrectly assumes there is no correlation over the longer-term. The results validate the robustness of the previous finding and imply that here is no evidence that atmospheric CO2 is responsive to fossil fuel emissions at an annual time scale net of long term trends. His conclusion is that the subject correlation is essentially ZERO. His robust statistical conclusion is that changes in atmospheric CO2 cannot be attributed to fossil fuel emissions. That is not the paper's conclusion. The paper's conclusion concerns annual changes in CO2. That's completely different from the argument Dr. Berry is making. For purposes of illustration I showed the impact of using such an approach (low correlation) to mask the link between human CO2 emissions and atmospheric CO2 (1976-2014 period for which I was able to get data) in the spreadsheet attached to this message. If one stretched Dr. Berry's analogy to global temperatures, one could point to annual changes in temperature based on ENSO i.e., dips related to La Niña and annual increases due to El Niño, and come up with a very low correlation with annual changes in atmospheric CO2 (relatively steady increase) and conclude that there is little correlation between the two. Yet, over the longer-term, one finds a very strong correlation between the global temperature anomaly and atmospheric CO2. Dr. Berry's approach would be to take the second approach, then conclude that the correlation between atmospheric CO2 and temperature anomalies is low. In fact, by taking a correlation from something that addresses a different question (temperature variability on a year-to-year basis which is dominated by internal variability), the very strong correlation between atmospheric CO2 and temperature anomalies would be masked. One can use the "Correl" function in Excel to calculate the correlation coefficients. P.S. I posted the comment about his incorrect approach to addressing the issue concerning fossil fuel emissions and the long-term increase in atmospheric CO2 on his blog. Interestingly enough, bituminous coal-fired power plants that have added SCR and Scrubber technologies tend to increase the amount of SO3 (ie acid rain) leaked into the atmosphere. Usually in those photos I look for the blue tint at the end of the water vapor which indicates a presence of sulfuric acid. Munshi found no correlation using annual data for 57 years. That means human emissions did not cause the observed, almost steady increase in atmospheric CO2. There is no significant cause and effect. The statistics for 57 years strongly imply that we would find the same result if we had 1000 years of data. 1. Munshi measured the correlations in annual changes between fossil fuel emissions and atmospheric CO2 over a 57 year period. 2. Munshi did not address the issue cited in the second sentence. Just because the net change in atmospheric CO2 concentration, which is a function of CO2 emissions (natural and anthropogenic) and CO2 absorption, had little correlation with annual fossil fuel emissions does not mean that, over time, such emissions did not lead to an increase in atmospheric CO2. The 57-year period is relevant to the problem that was studied. Dr. Berry is drawing a conclusion that goes beyond the issue addressed in Munshi's paper. Yes I am completely dismissive on Salby/Berry and proud of it. I feel you are being dishonest. You say you want technical discussion, but you have completely ignored every technical point. Instead you focus on unimportant issues like d it.egrees, credentials, who can criticize who etc. If your belief is that Salby and Berry are above criticism because they have certain degrees, then there is no point in trying to have a discussion. My sincerest thanks for this post. Keep it up and the believers and the skeptics will unite in the shared knowledge that we truly do not know what we do not know. "Instead you focus on unimportant issues like degrees, credentials, who can criticize who etc." "Yes I am completely dismissive on Salby/Berry and proud of it." Please, if you must, feel free to be dismissive "of" these PhDs in Atmospheric Physics. Being dismissive "on" Salby/Berry is kinda wierd. So is this an example of the law of unintended consequences? SCR and Scrubber Technologies, I believe, are necessary to obtain required permits pursuant to the Clean Air Act? Thanks so much for directing your comments to the source. I look forward to the continuing dialogue!!!! Hope some many of you are watching the fascinating discussions on Dr. Berry's site, linked above in the first post, amongst Don, Dr. Berry and others. Don, keep up the good work. That is a tough crowd and you are certainly holding up your side of the discussion! Yeah, Don's posts are solid as always. Dr. Berry's arguments don't impress. I come over your house to watch a football game, and tell you I need to use your bathroom. You politely lead me to it, and I thank you and close the door. A couple minutes later, I walk out and join you back in the living room. You realize that you also need to relieve yourself, so you get up and head to the bathroom. You open the door, only to find yourself staring at a steaming pile of sh*t sitting in the middle of the floor. You walk back out, and with a disgusted look you turn to me and say, "what the f***, man?" To which I reply, "you haven't proved causation." Excellent analogy JC-CT. Do you work for the IPCC? 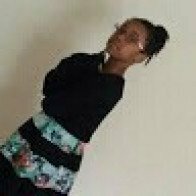 Anyone can post their thoughts on Dr. Berry's blog. You are cordially invited to join the discussion. I am sure comments like this will be greatly appreciated for their contribution to the scientific discussion.